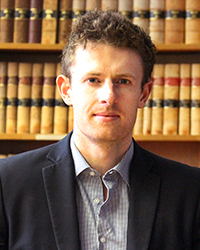 Scott Joblin is a PhD Candidate with the ANU College of Law. His research relates to Antarctic environmental protection and the legal status of the hydrocarbons of the Southern Ocean Area. His academic interests include Antarctic legal affairs, international environmental law, the law of the sea, and deep seabed mining. Scott has presented his research internationally, including in the US, Canada, UK, Norway, and New Zealand. He has been a Visiting Reader at the Scott Polar Research Institute, Cambridge University. In 2017, he was a rapporteur at the Antarctic Treaty Consultative Meeting (ATCM) in Beijing, China. More recently, he was also a member of the Arctic 100 Expedition - a Finnish-led icebreaker transit of the Northwest passage, which set the historic record for the earliest seasonal traversal. Scott holds a Master of Diplomacy and a Master of Strategic Affairs from the ANU, alongside a BA (Hons) in International Relations and a BA in Political Science from Victoria University Wellington. He is a prior recipient of the Freyberg Scholarship and the JFK Prize for American Government and Politics. Outside of academia, Scott's work experience includes roles in the New Zealand House of Representatives and NSW Government. After serving as a rapporteur at the annual Antarctic Treaty Consultative Meeting in Beijing, Scott Joblin is about to join an Arctic icebreaker expedition undertaking the North West Passage to Greenland. PhD Candidate Scott Joblin explores what implications the Scottish independence vote may have on the Antarctic Treaty. Antarctic Environmental Protection and the Legal Status of the Hydrocarbons of the Southern Ocean Area. Scott’s PhD research involves the examination of the interaction of the Antarctic Treaty System and 1982 United Nations Laws of the Sea Convention (LOSC) with respect to legal status of hydrocarbons in the Southern Ocean Area. In accordance with Article 7 of the 1991 Antarctic Environmental Protocol, the extraction of all hydrocarbons from the Antarctic Treaty Area (the area south of 60° South latitude) is prohibited. The geographic ambit of the prohibition applies to both the entirety of Antarctic continent and Southern Ocean seabed. A point of legal uncertainty, however, arises as to the legitimacy of the prohibition for those States party to both the Antarctic Environmental Protocol and LOSC. This is as a result of the declaration of the LOSC that the Area (the Deep Seabed) is the "Common Heritage of Mankind." Although this politico-legal concept is complex, central to it is the understanding that the minerals of the Area may be subject to potential utilisation pending such acts are approved and undertaken in accordance with the provisions and procedures of International Seabed Authority (the Authority being organ established by the LOSC charged to manage Area mineral activities on behalf of Mankind). Bearing in mind the recent maturation of seabed mineral extraction technologies, combined with the observation that many States – including Australia, are Party to both instruments, the objective of the investigation is to move towards a determination of the legal status of the hydrocarbons and whether their utilisation is indeed prohibited under international law.